3 (8 oz.) pkgs. cream cheese, at room temp. Brush 9-in. springform pan with melted butter. In large bowl, mix all crumbs, sugar, and 6. Tbsp. butter. Press onto bottom and 1 inch up side of pan. Bake 10 min. or until crust has set. Cool completely on wire rack. In small bowl, microwave peanut butter on high 30 seconds or until melted. Brush onto bottom crust. In large bowl, with mixer on medium speed, beat cream cheese and sugar until smooth, about 3 min. Beat in sour cream and vanilla. Reduce speed to low. Beat in eggs until combined. Remove 1 cup batter, set aside. Pour remaining batter into prepared crust. In small bowl, microwave 1/4 cup hot fudge topping in high 30 sec. or until pourable; fold into reserved 1 cup batter. Carefully pour chocolate filling over batter in pan and swirl with knife. Place springform pan inside roasting pan on rack in oven, carefully filling roasting pan with boiling water to come halfway side of springform pan. Bake until set around edges but slightly wobbly in center, about 55 minutes. Turn oven off. Remove pan from water bath. Return cake to oven and let cool inside, with door propped open slightly, 2 hours. Transfer pan to wire rack. In small bowl, microwave remaining 3/4 cup hot fudge topping on high 30 seconds or until pourable. Spread over top of cake with angled spatula; let cool. 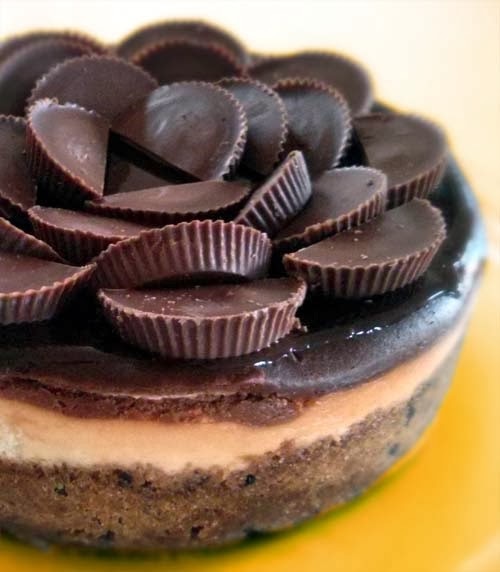 Garnish with peanut butter cups. Cover and refrigerate at least 6 hrs. or until well-chilled before serving.